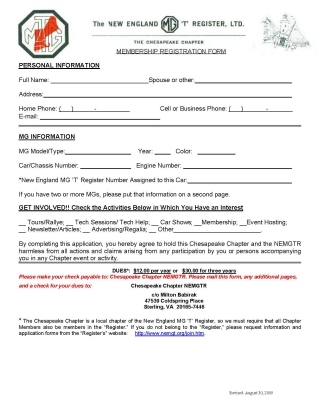 The below form can be used to send your information to the Chesapeake Chapter of the New England MG-T Register for Membership Registration or other information requests. Please note that we will never supply your information to a third party, will never use your information for telemarketing, and will use your information solely for membership application/registration purposes. You must print, fill-out and mail the form to the address specified below. You may do this by clicking here or by clicking on the form below (this requires the free Acrobat Reader). Note that you do not need to own an MG T-type, all that is required for membership is an interest in MG T-type and other classic automobiles! Please include all letters and numbers shown in the car and engine number boxed on the "maker's" plate. TD owners please note that there are three boxes on your "maker's" plate; include the information from all three. If the engine is a replacement, list the number of the engine actually in the car. This information is needed for the chapter's records and to correct and update the Register's files. Incomplete forms will be returned to you via your provided address, for needed corrections. If you have additional MGs, please attach additional forms as required. Please click on the form below to bring up a printable, .pdf version of the form.